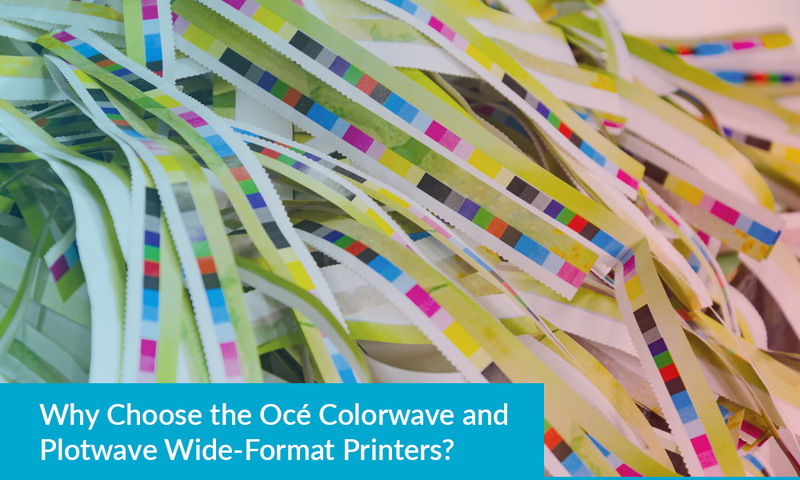 Why Choose the Océ Colorwave and Plotwave Wide-Format Printers? The time has never been better to invest in a wide-format printer. Whether creating external presentation materials or large plots for internal use, the ability to leverage fast turnaround and consumable efficiency is an important benefit that no organization can overlook. The Canon Océ product line is leading the way in delivering quick turnarounds and best-in-class cost-effectiveness. Whether printing color or monochrome wide-format documents, you can rely on Canon's industry expertise to fulfill your expectations. Each of these large format printers come with Canon's industry-leading ClearConnect software technology, which combines multi-touch gesture compatibility with best-in-class security features for the modern workplace. These printers support disk encryption, access management protocols, and feature removable hard drives. 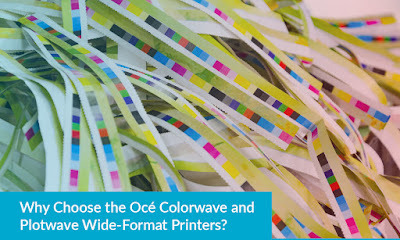 One of the most valuable offerings in the Océ product line is the Colorwave 500. This color printer offers world-class print speed – up to 225 D-sized prints per hour – and does so without requiring you to invest in expensive specially-coated paper. Furthermore, the device's small footprint makes it an attractive addition to any busy printing floor. It lets print process owners save on space, supplies, and maintenance through a number of clever engineering adjustments. For instance, it uses a single system for both color and monochrome work, reducing the number of different mechanical components that need to work together to produce quality prints. The Océ Colorwave 500 prints large-format documents in breathtaking full color. Thanks to Canon's dry-toner technology, graphics-quality full-exposure prints are dry instantly upon printing – unlike other wide-format printers that force organizations to wait for prints to dry, exposing them to the possibility of smearing and damage in the process. Use the Océ Colorwave to immediately handle, stack, and fold large-format documents upon printing. If you don't need large-format color prints, this small, affordable plot printer is the ideal solution for your print room. It is a highly configurable printer with an extra-small footprint. The top delivery tray is engineered for air separation and neatly stacks and collates up to 50 E-sized plots. The Plotwave is a highly detailed monochrome printer that creates high resolution documents at 600 x 1200 dpi. It is also one of the quietest printers of its type in the industry – it does not feature the noisy fans that were the cooling standard of previous generations of plot printers. The PlotWave features Océ Image Logic technology, which automatically compensates for color saturation problems, converting brightly-colored or high-contrast originals to clean, high-resolution black-and-white prints. It also compensates for wrinkles and other imperfections in the original copy, and detects the dimensions of original documents automatically. The PlotWave features Radient Fusing allowing instantaneous warm up for the machine, increasing your productivity. Whereas the two Océ printers mentioned above are small-format devices meant to combine affordability with efficiency, the Océ ColorWave 910 is a powerhouse wide-format printer designed to handle the most challenging jobs with ease. This printer is the centerpiece of a digital workflow that boosts productivity, decreases operating costs and improves print room flexibility for enterprise organizations. With a raw print speed of 12,000 square feet per hour, six incorporated media rolls, and an embedded stacker, print jobs that would previously take a week to complete now only take a single day. This large-format printer uses five aqueous dyes in two-liter ink tanks. It prints at a maximum resolution of 1600 x 1600 dpi, with droplet sizes of 1.2 picoliters. There is no parallel to the depth and vibrancy of its color palette – it even includes two sets of black ink to optimal optical density. With a range of finishing options, operators can seamlessly switch between high-impact projects without having to spend expensive man-hours retooling or calibrating the device. It is compatible with the Océ Esterfold 5011 folder, the Océ Dual Tray High Capacity Stacker, and the Océ Deliver Tray, among a broad range of more advanced finishing options. These are just three of the leading printers in the Canon Océ product line, which includes options and feature sets for every organization. Learn more about these powerful devices to identify which one has the productivity, efficiency, and feature set your company needs. Whether you need fast, vibrant color prints or affordable monochrome plotting, there is an Océ printer for you. We sell and service the full Océ Product Line, which is the number-one Wide Format product in the world. Supported by personnel with more than 40 years of combined experience. All units have on board 36-inch color scanning with up 42-inch output, and an Océ accounting manager for job tracking and cost recovery. Please Contact Gerald Williams at 425-425-229-1631 for more details or a private demonstration!